Owners can certainly teach their dogs new tricks thanks to stem cell therapy available from a Coventry company. Cell Therapy Sciences provides state-of-the-art technology to help relieve pain and disability in osteoarthritis and other joint problems in dogs. Vets perform a small operation to remove one teaspoonful of fatty tissue from under the animal’s skin along with a blood sample. These are then taken to a specialist laboratory at the University of Warwick Science Park’s Venture Centre in Sir William Lyons Road where the stem cells are grown up and prepared before being returned to the vet for injection into the dogs. Dr Joanna Miller, science director at Cell Therapy Sciences, said she had previously worked at a company which had carried out similar stem cell treatments in horses to repair their tendons. “Many dogs have problems with arthritis and there is good evidence that stem cell treatments can help,” she said. “I wanted to set up a business where the treatment would be affordable for dog owners and give them an individual service. “It takes about 10 days to grow up the cells and carry out all the tests to make sure they are healthy and ready to inject. “The key is that we’re growing the dogs’ own cells so that the vet can give them back to the dog to enhance repair naturally and make it easier for them to walk and play because they regain movement in their joints. Joanna said Cell Therapy Sciences had an office as well as a laboratory at the Venture Centre. She added: “It is very helpful working here because we receive parcels containing samples from vets which means we need someone here full-time to receive them which the receptionists do when we are out of the office at meetings or busy in the lab. 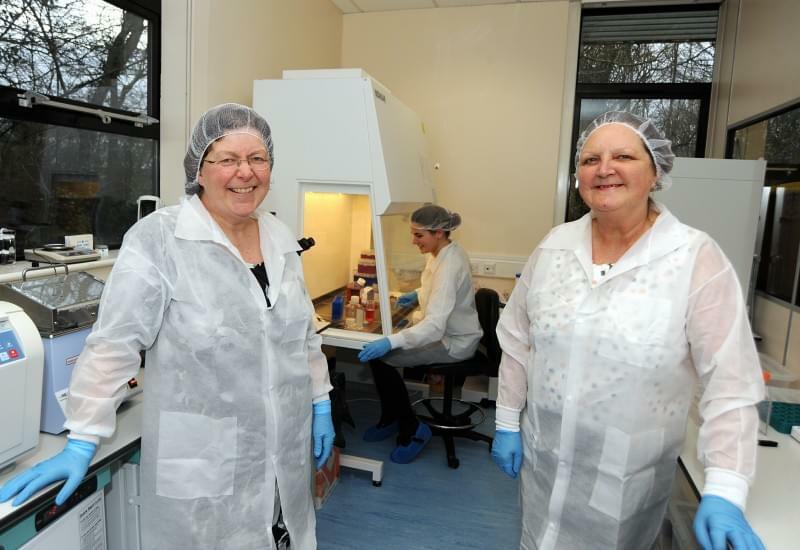 Karen Aston, manager at the Venture Centre, said Cell Therapy Sciences was carrying out ground-breaking work. She said: “Cell Therapy Sciences has carried out stem cell therapy for vets located from Scotland to Cornwall to reduce the levels of pain for their customers’ dogs. “The therapy is natural and safe and it is really interesting to see the advances in medical science helping pets.